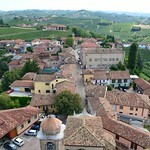 Barbaresco is an Italian wine made with the Nebbiolo grape. Barbaresco is produced in the Piedmont region in an area of the Langhe immediately to the east of Alba and specifically in the comunes of Barbaresco, Treiso and Neive plus that area of the frazione San Rocco Seno d'Elvio which was once part of the comune of Barbaresco and now belongs to the comune of Alba. It was granted Denominazione di origine controllata (DOC) status in 1966 and Denominazione di Origine Controllata e Garantita status in 1980. The wine is often compared with Barolo—another Nebbiolo based wine from the Piedmont area. Though the wines do share many similarities, there are some distinct differences between them.